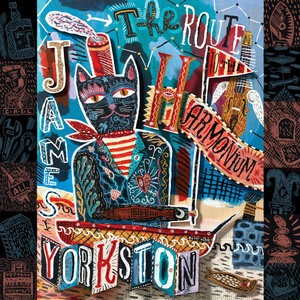 Esteemed Scottish folk singer-songwriter James Yorkston heads into midlife with The Route to the Harmonium, and no has affection for what he sees. Like the movies of Wes Anderson, James Yorkston's albums exist in a well-established, insular, immediately-recognizable world that is subject more to subtle variation than drastic reinvention. Just as one would not expect Anderson to all-of-a-sudden pull a coarse, grimy sci-fi epic out of his sleeve, it would be silly to expect Yorkston to move from his airy, quiet Scottish folk to, say, dubstep techno. Therefore, when an album like The Route to the Harmonium comes along, Yorkston's seventh or so in an 18-year career, it would be easy simply to mark it as "another James Yorkston album" and leave it to his dedicated fans to suss out the subtleties. The Route to the Harmonium, though, is something a bit more than another in a line of Yorkston albums. It is also, unfortunately, something a bit less. Why is it that so many artists become less enjoyable just as they become more impressive? Yorkston's music has, over the years, become gradually more open to the progressive and experimental. While his primary instruments have remained his acoustic guitar and assured yet calming voice, he has added wrinkles and flourishes. He has, at different times, turned over production to members of Cocteau Twins, Four Tet, and Hot Chip, none of whom will ever be pigeonholed as folk bands. Most significantly to The Route to the Harmonium, though, are Yorkston's two albums with double-bassist Jon Thorne and Indian sarangi player Suhail Yusuf Khan. Though still based in Yorkston's traditional sound, they also incorporated elements of freeform jazz and Eastern drone music, and they were recorded between Yorkston's The Cellardyke Recording and Wassailing Society (2014) and The Route to the Harmonium. The latter has clearly been affected by these collaborations, most notably in the form of Tom Arthurs' trumpet, which wafts in and out of songs, free jazz style, much as Khan's sarangi did. Also, though Yorkston recorded most of The Route to the Harmonium alone, it is denser than any of his other work to date, with esoteric instruments like the nyckelharpa, Dulcitone, and something called a Bookorder often pressing in against the acoustic guitar. Yorkston's music has always been atmospheric and allowed for ambient room sounds and tape hiss. But it has rarely been as oppressive and at times downright dissonant as it is on the likes of "My Mouth Ain't No Bible" and "Yorkston Athletic", both spoken-word pieces with tempestuous, pounding rhythms. Even the more familiar slate of ballads have an uneasy sort of closeness to them. If the music is at times uncomfortable, Yorkston's lyrics leave no quarter. As sincere and carefully-crafted as ever, they are almost shockingly bleak. The narrator of "My Mouth Ain't No Bible" puts it well: "My mind just cracked, but unlike [Leonard] Cohen, no light got in, just dark." When Yorkston's characters reflect, it is with nihilism rather than wisdom or fondness. His lovers are failed lovers, as in "Brittle" and "Solitary Islands All". "I did my best / But I was not trained for this," one says on "The Villages I Have Known My Entire Life". Yorkston can still turn a phrase, but the coy, winking cynicism has been replaced with stone-faced resignation. Beneath the inherent prettiness of his music lurks the inherent ugliness of humanity. "Maybe this is why life speeds up--," he says at one point, "We're eager to see off the shame." Is Yorkston undergoing a Tom Waits-style mid-life, mid-career evolution, allowing an implied heaviness to give way to an overt density? Quite possibly. Waits' best work never left the playfulness completely behind. No doubt, The Route to the Harmonium is an impressive artistic statement. Too often, and especially when compared with Yorkston's previous work, it is something less than enjoyable.